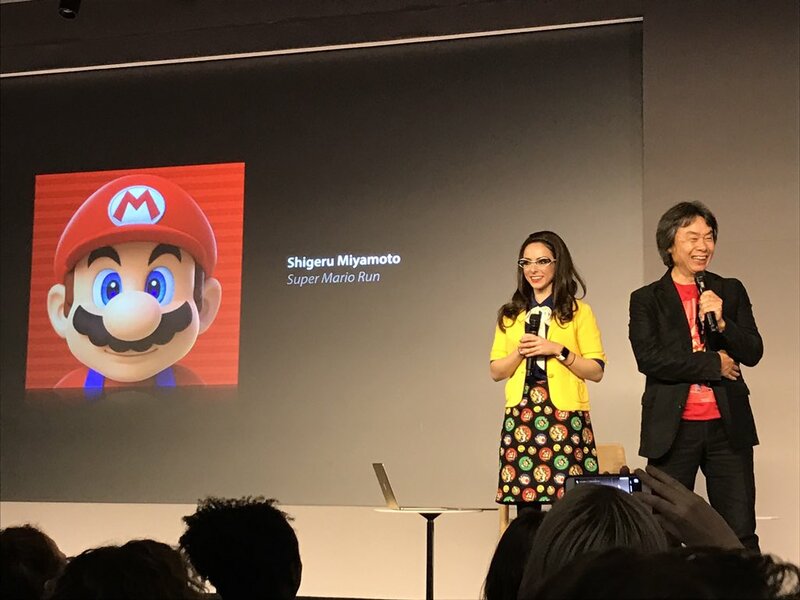 At 6pm, to a packed house of fans (including many dressed as, or bearing the logo of, their favorite plumber) Nintendo game designer Shigeru Miyamoto sat down with Katie Linendoll from The Today Show to talk about his illustrious career including, of course, Super Mario Run. Speaking with the help of Bill Trinen, a senior marketing manager at Nintendo, as a translator, Miyamoto took us from the very beginning of his career to the current day, and to what the future might hold. “I keep making games because people keep playing games” Miyamoto began “and one of the reasons I like to continue to make games is because technology keeps evolving and I keep having my own personal life experiences and I keep looking for ways to combine the two into new games.” When asked if it was easier to create in the time of 8-bit graphics, Miyamoto went on to say that the technology and graphics were simpler so it was easier to focus on making the gameplay fun. Another element that was discussed was that with a smaller team of 5 people, it was easier to have pride for directly creating elements, whereas now, even smaller games require a team of 30 and you don’t really know who was responsible for which part. “The battle that I fight is with all the talent, I have to keep reminding them why I’m important in the process.” It’s not all bad though, as Miyamoto went on to discuss how convenient current development process were. No more does code have to go through an assembler, the iOS environment is so advanced, Nintendo is able to make what they call “spec changes” — tiny changes to level design or programming — very, very quickly. Miyamoto talked about how he began at Nintendo as an apprentice, cold calling a recruiter to offer his services as an industrial designer, and forcing them to give him an interview even when they said they didn’t need one, and landing the job when showing a portfolio piece to a department head. A year later, after seeing the success of Space Invaders, Nintendo decided to get into the video game business and Miyamoto began designing graphics. The most interesting part of the evening was when Katie dug deep into Mario “Dude,” she said, “it’s a weird premise. Two plumbers? A princess? Other random characters? How did you think of this in your brain? And how did you get Nintendo to buy in?” Miyamoto described how it actually started with a gorilla, and the two things that make video games fun. “You play and you try something and fail and try again and it’s that thinking process, that’s fun. The second is when somebody is watching you play, and they say ‘give me the controller, I can do better!’ So, what you’re showing has to be simple enough to see what you need to do, and that’s why in my first game [Donkey Kong] the gorilla is at the top and it’s very apparent that you have to follow the sloped girders to get up to the gorilla and that’s where Mario first appeared — at that point he was a carpenter.” Next, for Mario Bros., Miyamoto decided his now-two heroes (Mario had been given a brother) would be fighting turtles and the turtles would have to drop down from the ceiling and have a way of getting back up, and so they would need pipes that meant sewers and thus Mario became a plumber. And for the third game, it had been decided that Mario was to get bigger and smaller and to motivate the change, the only thing that made sense was a fairy tale mushroom, and if you’re running through the woods with magic mushrooms, what else could you be doing but saving a princess? “And that’s how we ended up with a princess and a plumber.” Miyamoto finished. “It all makes so much sense” said Katie, to the audience’s laugher. 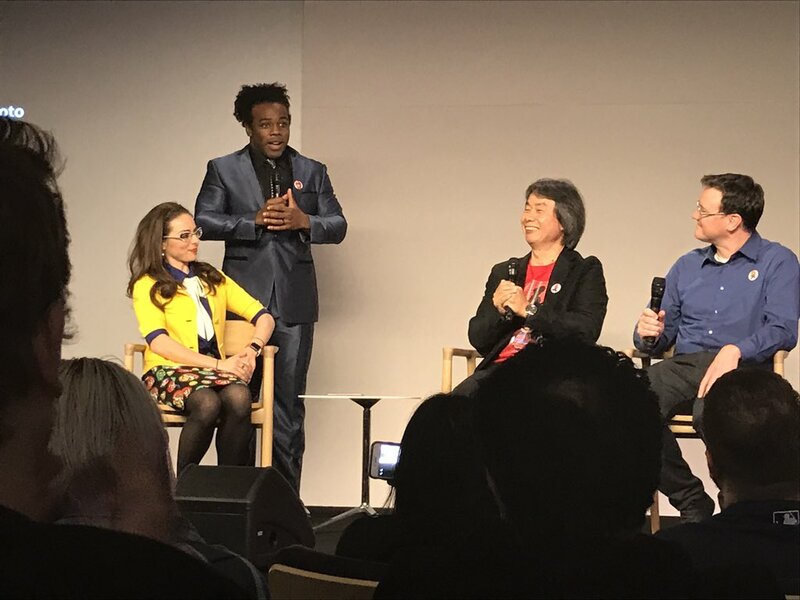 Miyamoto touched on how he drew on his experiences walking in the mountains around his home for The Legend of Zelda, how in his collaborations with Takashi Tezuka and Toshihiko Nakago, no project will move forward unless all three of them agree on it, and how every success is met with “well, we got lucky,” and how every project gets an internal post mortem before it’s even released, so “ I have to get back to Japan to do a post mortem before December 15th!" When asked what the catalyst was for doing a smartphone app now, Miyamoto referred to how Nintendo had previously been first party platform only due to the increased overhead for cross-platform compatibility and being able to use the full power of the platform, but now that iPhones were powerful enough that Nintendo was able to achieve really met their gaming performance expectations. 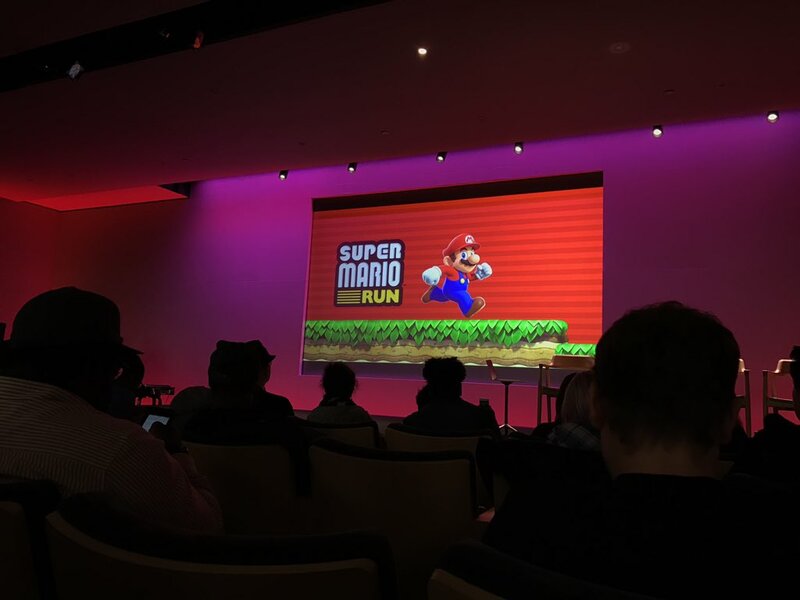 He also discussed that the concept for a “one-button” Mario had been floating around amongst Miyamoto, Tezuka, and Nakago for a while and when they tried it on iPhone they decided now was the time to make Super Mario Run— and of course Apple support helped. Katie asked a question from a Twitter user Noah Sanches “any difficulties developing for touch screens?” Miyamoto took a moment and said “One thing people often forget — even though it might not have been capacitive, we had a touch screen device before the iPhone even released” He went on to say, Nintendo and Apple agreed that touching something and seeing it react was the simplest mechanism. And as for Super Mario Run, Miyamoto said there were a lot of inquiries about using swipe or 3D Touch to add functionality but it would be simplest to have control based only on the tap of your screen, so anybody who’s playing for the first time would have fun. But not to worry, Nintendo has a lot of incredibly advanced gamers so Super Mario Run has a lot of skill and technique to discover — and even challenges for advanced gamers. To tie into this, Miyamoto discussed that when playing Mario games, advanced gamers will keep Mario running consistently, while novice gamers often say its difficult to control Mario, especially while holding a button to make him run, so a constant running game would solve both these problems for novices and experts. 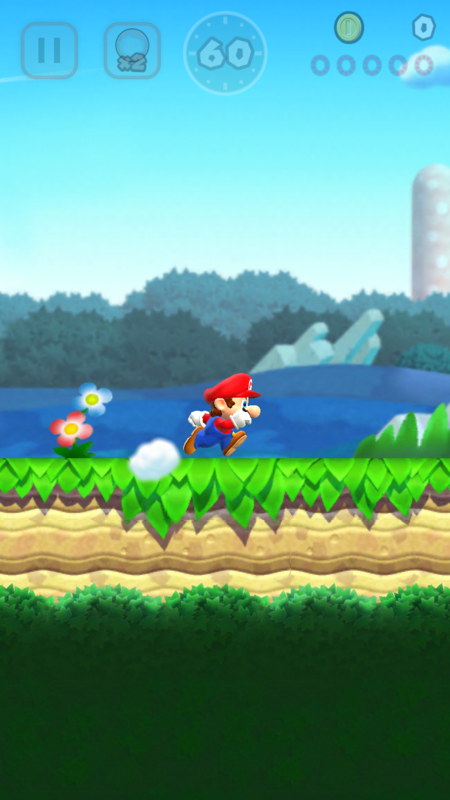 “But of course if all Mario did was just run, that wouldn’t be very fun” Miyamoto said “so then what we did, was we said ‘how do we give the player a way to go backwards at times, if they want to go backwards?…and that’s where we came up with the solution of Special Blocks” Special Blocks cause special jumps, or for Mario change direction. 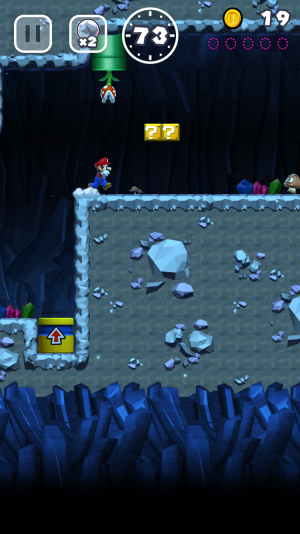 For enemies, Miyamoto described adding many different actions like automatic enemy hurdling and vaulting so the player can concentrate on jumping. “The game actually has a very different feel than previous Mario games, because it has it’s own unique tempo and rhythm to it.” Miyamoto described moments where Mario will be hanging from a ledge and the player will have to wait for the right time to jump off. He also described two new jumps, similar in functionality to ground pounding and shell hopping from previous Mario games, but with new twists. Katie asked if there was any character that Miyamoto wished he had developed more. “I always wanted Fox McCloud to be a bit more popular than he is.” He went on to say Pikmin was very special as well but “wouldn’t make a good Halloween costume." “So as far as whats going to happen in five years, it really depends on what kind of new technology I come across and at that point, I’ll partner that new technology with Mario — or maybe Link — and create something new."